Donald Darwin Jensen, 81, passed away on January 28, 2019. Don was the youngest of five children born on February 4, 1937 to George and Emma Jensen in Westhope, North Dakota, where he lived for most of his childhood. He graduated from Sherwood High School in Sherwood, ND and then attended State School of Science in Wahpeton, ND. He then moved to Fargo, ND and during this time he met and married Betty Jane Boyd in 1960 with whom he had two children. In Fargo, he began his 32+ year career in telecommunication with Southwestern Bell, later known as ATT. His job required that he and his family relocate to Minneapolis, MN for a number of years, and then again to Kansas City, MO in 1970, where he and Betty raised their family until her death in 1986. Donald retired from ATT in 1989. He met Peggy Shepherd Dixon and the two were married in 1990 until her passing in 2006. He worked a variety of jobs after retiring, one of them being at Windbrooke where he was able to enjoy one of his favorite pastimes, playing golf, though he always insisted walking and refused to ride in the golf cart. His favorite secondary job was driving buses for the Park Hill School District, specifically for concerts, field trips, and sporting events. This job afforded him the opportunity to watch many of the sporting events and he had a special fondness for the Park Hill South girls’ basketball team, who “adopted” him as their number one fan. His love of sports didn’t stop there, he was an avid fan of KU basketball and the Kansas City Chiefs and Royals. He also took great pride in his wood working and keeping an immaculate yard. Donald is preceded in death by his parents; first wife Betty; second wife, Peggy; and sisters, Pearl Gross, Louise Lesmann, and Petrine Vigen. 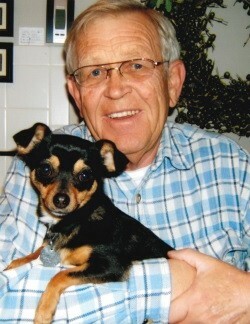 He is survived by his children; Tara (Randy) Deckard and David (Vonda) Jensen; grandchildren, Zoey Jensen, Alex, and Graham (Jensynn) Deckard; brother, George (Etta) Jensen of Fort Smith, AR; numerous nieces and nephews, and his loyal companion and Chihuahua, Bitsy. A Celebration of Life will be held at Terrace Park Funeral Home on Monday, February 4, 2019 from 7:00 pm to 9:00 pm. In lieu of flowers, contributions may be made to the St. Luke’s Hospice House.